Wow, that sounds like one heck of a ringing endorsement! But while Touch Foo's Swordigo isn't quite the magical amazingness suggested by the combination of two of the greatest gaming franchises of all time, it is more or less the result of a mechanical combination of the two games. Action-RPG Zelda hacking and slashing meets 2D Mario platforming. Sound fun? It is! 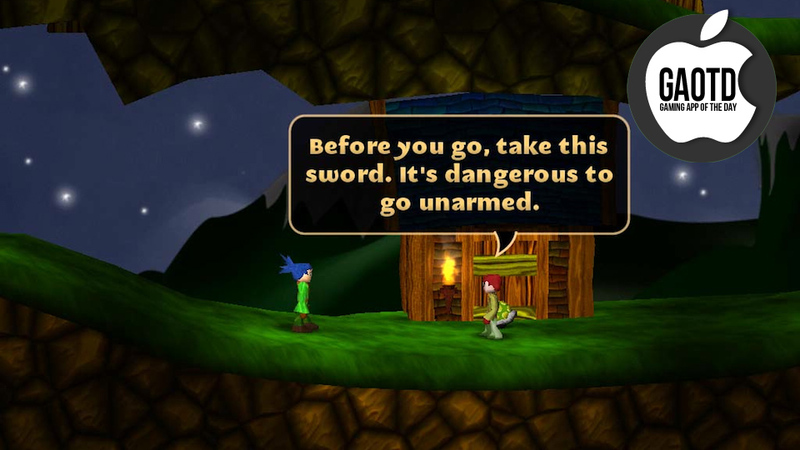 Swordigo's story plays like a deliberate (almost winking) Zelda homage, in which you take on the role of a blue-haired youngster who sets out to save his people from the rising of an evil presence. There is very little original going on here — in fact, that almost seems to be the point. (See the above screenshot to get a sense of what I'm talking about.) All the same, Swordigo is a fun and satisfying game, mainly because its core mechanics work well on a touch-screen. I played on an iPad, which always feels a bit ungainly for action games, but the left/right buttons and the action commands all fell right under my thumbs, and I never found myself accidentally putting in the wrong commands. As a result, the game's platforming and swordplay felt natural and fun, and as I got used to the controls I found that I was really enjoying myself. This is largely due to a well-implemented, forgiving degree of aftertouch — moving yourself through the air is a snap, and if you miss a jump you can often hit a double-jump and save yourself. The art-style is fun and colourful, if a bit repetitive in the early stages; there seems to be a whole lot to the game, as well. I've played for an hour or so, and have already found myself gradually levelling up. The whole thing is presented in a pleasing 2.5D style, with a lot of colour and a rolling backdrop. Sure, it might get old after a while, but as a way to kill time on the bus, it's actually a heck of a lot of fun. Give Swordigo a shot — it's an enjoyable, well-made hack 'n slash game served with a side-dish of possible addiction. Show and awe. Never heard of Zelda II?